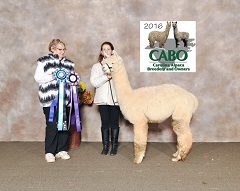 Cleo's Alpacas wants to introduce you to our co-owned outstanding male with great fiber who will be adding cria to our breeding herd this spring. 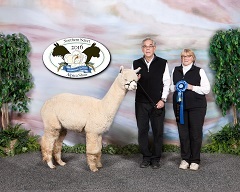 This male has done superb in the show ring and we will be offering limited breeding this year. He has shown as a 3.5 year old male and maintaining a very extreme beautiful fleece--great architecture, handle, density along with fineness. Give us a call or email to schedule a breeding to this fantastic male. Blues and championships in 2016.